Comet ISON, a pristine chunk of rock and ice from the extreme edges of the solar system, is making its first visit to the vicinity of the Earth and the Sun. And what a trip! Today, in a few hours, at 1:45 in the afternoon on the U.S. east coast, the comet will pass exceptionally close to the Sun — much, much closer to the Sun than the Earth or even the planet Mercury. At its closest, the distance from the comet to the Sun’s center will be only 2.5 times larger than the distance from the surface of the Sun to its center. To say it another way, the radius of the Sun is about 700,000 kilometers (430,000 miles) and the comet’s closest approach will be 1,200,000 kilometers (730,000 miles) above the Sun’s surface, or 1,900,000 kilometers (1,160,000 miles) from its center. Over the first few days of December, the comet will dim, but it will also move away from the sun and from the brightest light of dawn, and so it will also become easier to see. Try to look for it in the coming week! My current amateur’s guess (to be updated when I know) is that its remnant dust trail will spread out and dim very rapidly; you should not wait too long if you want to try to see it. For the moment, you can’t see the comet by eye; it is way too close to the incredibly bright light of the sun. The only way to observe the comet right now is via satellites. The close approach is best watched through the camera of SOHO (the Solar and Heliospheric Observatory satellite). 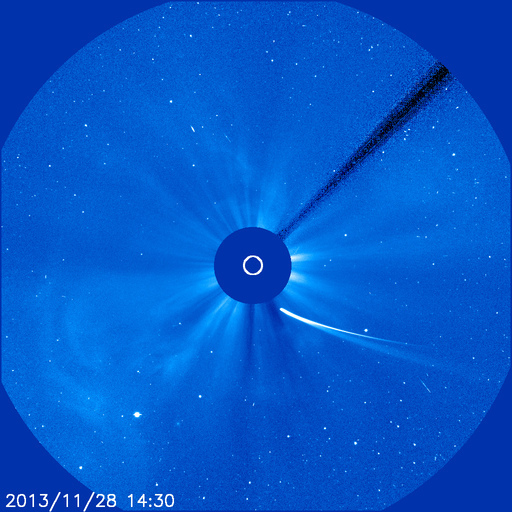 There’s a recent movie here from SOHO that shows the comet has brightened very rapidly in the last 24 hours. [The sun lies at the center of the image, drawn as a white circle, and is shaded from SOHO’s camera by a shield that forms a larger black dot in the center of the image.] The bright star Arcturus sits at the lower left of the image, and the comet is [was, this morning,] much brighter than that! Its maximum brightness may eventually approach that of the brighter planets, Jupiter and even perhaps Venus. Click here for the latest SOHO image, and here for the latest closeup image (which as of writing doesn’t show the comet yet.) A recent image is below. Comet C/2012 S1 ISON from the NASA SOHO spacecraft on November 28th as it approached the sun. This entry was posted in Astronomy and tagged astronomy, CometISON, comets. Bookmark the permalink. Not long now Professor, fingers crossed ! The latest images coming in from SOHO are not encouraging. The coma looks to be completely gone. It looks like the nucleus has completely disrupted and is spreading out along the comet’s orbit. It was pretty obvious when SDO did not see ISON that there was no ice left. Only dust came out the other side.